Enhance your furniture painting projects with our specialty products. Americana Decor's wide range of specialty products work together with our paints to allow you to create a variety of special effects and perform special painting techniques. Use this specially-formulated primer on already rusted surfaces to block further rusting. One jar provides two-coat coverage on approximately 29 square feet. Available in an 8 oz jar. Add a durable, protective top coat to home decor pieces for use outdoors. Can be used on unpainted or previously painted surfaces. Dries to a clear, eggshell finish. Specially formulated to be more durable and weather-resistant than a varnish. Push wax down into carved surfaces or crevices on your project with this large, round waxing brush that has stiff bristles. The handle is comfortable to grip for larger projects. Enjoy easy and mess-free painting with these flat brushes. They are comfortable to grip and make difficult-to-reach areas seem not so daunting. The bristles are strong and durable, yet remain flexible. The brushes can also be used for adding texture and creating many other faux finishes. Available in 4" and 2" sizes. Reach into corners and other difficult areas with this angle brush. The bristles are strong and durable, yet remain flexible. The brush can also be used for adding texture and creating many other faux finishes. Available in 1" size. Use a brush to apply an even coat of medium over the sealed or painted surface. Brush on in the direction you want the cracks to appear. Allow to dry. 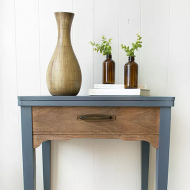 Apply a thin coat of a contrasting color of paint on top of dried medium. Do not overwork. Crackle effect will occur during drying process. 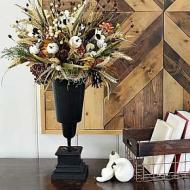 Once dry, seal with an Americana Decor Varnish. Cleans up with soap and water. Use a brush to apply an even coat of medium over the clean, dry surface. Once dry to the touch, add an additional coat for further protection. Cure for 3 days before exposure. One jar provides two-coat coverage on approximately 42 square feet. Water-based. Cleans up with soap and water. Do not trim your image too closely. Leaving room around the image will allow you to gently sand the edges after you transfer your image to make it blend into the background better. Visit the education page for detailed instructions. Pre-wash and dry fabric first. If working with layers of fabric, insert a piece of cardboard covered with wax paper between the layers to prevent sticking. Allow to dry 72 hours before hand-washing. Air dry. Do not dry clean or iron. For a machine-washable finish, topcoat with Fabric Decou-Page and let dry for 72 hours prior to machine washing. Learn more about the products in the Americana Decor line and get useful tips and techniques for using them. 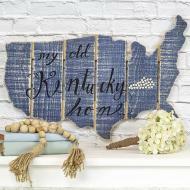 Get inspired with our home decor DIY projects made with Americana Decor products.